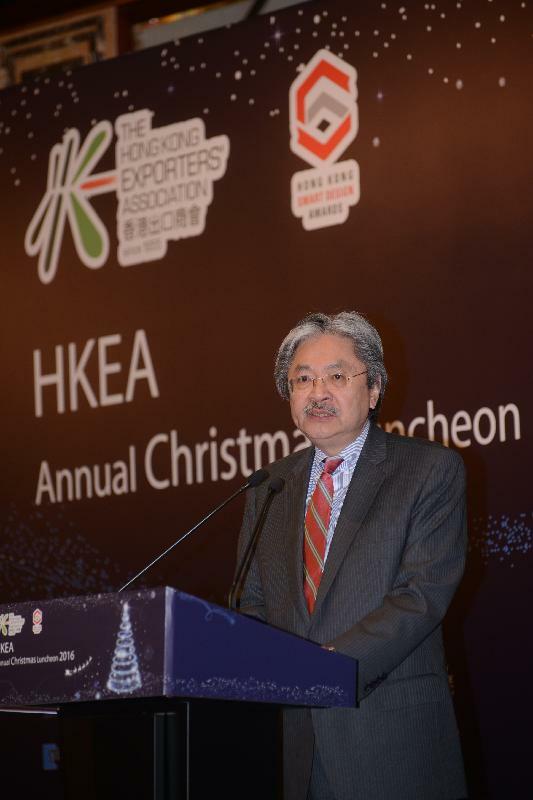 I am indeed pleased to join you all, once again, for the annual Christmas luncheon of the Hong Kong Exporters' Association. Just last week, I attended the reception to celebrate the 50th anniversary of the Hong Kong Export Credit Insurance Corporation (ECIC), where I expressed my sincere gratitude to the staff and members of the Corporation for their remarkable contribution in providing essential credit insurance for local companies in managing overseas buyer risk as well as country risk, which in turn, helped Hong Kong's export sector flourish and blossom. So I am grateful to have this opportunity today, to show my sincere heartfelt appreciation to you as well, the Hong Kong exporters, for your outstanding achievements, your tremendous resilience and indomitable "can-do" spirit, that has helped build the economic miracle that we call Hong Kong. A vibrant and energetic business sector has always been the cornerstone of our economic success. The synergy and the close co-operation between government and business has always been the underlying foundation that fortifies the enterprising spirit that permeates our society. Our trade is more than four times our GDP. Last year, our export value reached HK$3.6 trillion. That was 1.8 per cent down compared with the 2014 total, but these are tough times for exporters - we all know that. And still, last year I am proud to say, we maintained our standing as the world's eighth-largest trading entity, and the world's seventh-largest exporter in merchandise trade. The global economy in the coming year will be affected by a number of uncertainties and you can name them, but, thankfully, we are still continuing on a modest growth path. The Hong Kong economy picked up by 1.9 per cent in real terms in the third quarter of 2016 over a year earlier, following a 1.7 per cent growth in the preceding quarter. Domestic demand gathered further pace, while external demand also saw relative improvement. That should offer some support and perhaps relief to Asia's trade as well as your exports. Let me assure you that the Government will continue to provide support to the industry in the pursuit of sustainable growth. The Trade and Industry Department will continue to operate a variety of funding programmes to enhance the competitiveness of our SMEs, the heart and soul of our economy. One programme that you should all be familiar with is the SME Export Marketing Fund. I am sure that many of you here today have taken good advantage of the Fund in expanding your businesses through export-promotion activities that were supported by the Fund. Over the years, we have continued to fine-tune this Fund, relaxing conditions for the use of the grant and expanding the Fund's scope to cover activities such as electronic and media promotion. I announced also in my Budget this year the extension of the application period for the special concessionary measures under the SME Financing Guarantee Scheme for the fourth time, now to the end of February 2017. And the annual guarantee fee rate for the measures has been reduced by 10 per cent. In addition, the minimum guarantee fee rate for the measures has been totally removed, in order to help companies obtain loans and reduce the cost of financing. The Hong Kong Export Credit Insurance Corporation, as I have mentioned earlier, has been playing a key role in facilitating Hong Kong's export trade as well. It has put in place a wide variety of initiatives to support our exporters, especially SMEs. In 2013, the Corporation introduced the Small Business Policy, targeting exporting companies with an annual turnover of less than $50 million. And in March this year, the Corporation offered another boost to SMEs by waiving the full annual policy fee permanently, while offering a 20 per cent premium discount for all Small Business Policies. The point here is clear: we simply want to enhance the competitiveness of our SMEs. At the G2G level, we are working hard to strengthen ties with our trading partners in order to help our exporters explore and enter into new markets. More than 50 per cent of our exports are destined for the Mainland of China, and our largest trading partner continues to hold great potential for exporters. And we shall, rest assured, continue to strengthen co-operation with Mainland authorities at all levels to enhance the competitiveness of Hong Kong products in the Mainland market. I visited Beijing just a few days ago and had meetings with a number of central authorities. The talks have been useful and very constructive. At my meeting with the Minister of Commerce, Mr Gao Hucheng, we agreed to further explore new facilitation measures under the framework of CEPA. And the work is in progress. The ASEAN bloc, I want to mention, a market with more than 600 million people, is our second-largest trading partner. Last year, the total value of merchandise trade between Hong Kong and ASEAN exceeded US$106 billion. And that, ladies and gentlemen, is bigger than Hong Kong-US trade or Hong Kong-EU trade. And we are confident that our trade will continue to expand, following a Free Trade Agreement that we are aiming to finalise with ASEAN in the near future. We are still sorting out a few details, but we are hopeful that we would be able to complete the negotiation in a timely manner. The Hong Kong-ASEAN FTA will help stimulate further flow of goods, services and investment between Hong Kong and the ASEAN countries, and help expand the wide spectrum of opportunities for exporters of Hong Kong. And opportunities ahead will not get any bigger than the Belt and Road Initiative, which will no doubt become the driving force of the global economy in this 21st century. Structured along the framework of connectivity, the Belt and Road Initiative will, for certain, engender further demand and stimulate even stronger international trade and investment flow. As China's international financial and commercial centre, Hong Kong is perfectly positioned to become the hub for trade, for business and for investment of the Belt and Road region. Now you can find political and economic information on the 60-plus markets along the Belt and Road on the websites of the TDC as well as the ECIC. This useful information will certainly help you better understand the Belt-Road markets and the business opportunities that they promise. In the past two years, I have led a number of business missions to major economies along the Belt and Road, including for example Poland, Germany, Hungary, Kazakhstan, the UAE as well as Iran, and many of our enterprises and professionals were able to see for themselves the massive business opportunities and potential that these emerging markets can offer. So I am glad to say that these trips have all been very truly rewarding and fruitful. And from what I have seen and heard, I am also glad to say that the future of our export sector will continue to be promising as well. And on that note, ladies and gentlemen, I wish you all a prosperous and healthy 2017, and of course, Merry Christmas.